The Firm of John Hood & Son (Dingwall) was established in early 1900. It is now the family run business of Stewart & Caroline Bain. All memorials shown can be made in any size and any colour of granite. Designs can also be interchanged. Please note that the examples shown are only a small selection of what is currently available. 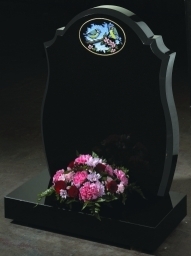 Memorials are manufactured using the best material and can be made to your own specification. Additional inscriptions, renovations etc, carried out in all Cemeteries. Designs and estimates supplied with no obligation. Distance no object. If you require any further information please contact our office, our staff will only be too pleased to assist you.